This is kind of random but the other day I was halfway into a recipe and realized I needed buttermilk. We don’t usually have buttermilk on hand but never fear! 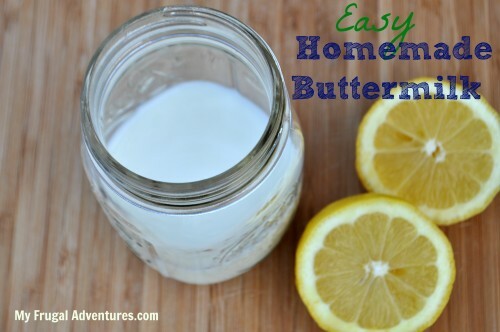 It is super easy to make your own buttermilk two different ways- so hopefully you have the ingredients on hand to mix up your own. You want this to equal one cup total- so the best bet is to add the tablespoon of lemon into a measuring cup and add the milk after until it is at the one cup mark. Let it sit for a few minutes and viola! You want this to equal one cup total- so the best bet is to add the tablespoon of white vinegar into a measuring cup and add the milk after until it is at the one cup mark. Let sit for a few minutes and that is it! So easy peasy to just whip up if you ever find yourself short of buttermilk. Another quick tip I learned years ago is that buttermilk can be frozen. Usually you buy the container and only need a tiny bit so you can for sure freeze it for a few months to extend the expiration. The best way to freeze buttermilk is to pour it into ice cube trays and then freeze and then pull it out and pop it into a Ziploc. Another option would be to freeze it in baggies (you might consider measuring it first)- say 1/2 cup or 1 cup increments- pour into a Ziploc and freeze. 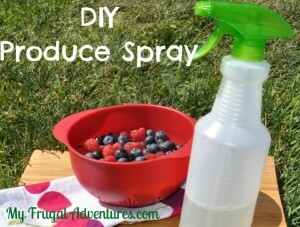 And did you know you can make your own produce spray at home? This is a great little something to mix up if you can’t always find or afford organic produce.